I am very happy to receive 1500 LinkedIn followers this morning! As a business blogger, I am grateful for each and every one of them. Moreover, LinkedIn is the business social media platform so there is validation that the business community recognizes and rewards talent. 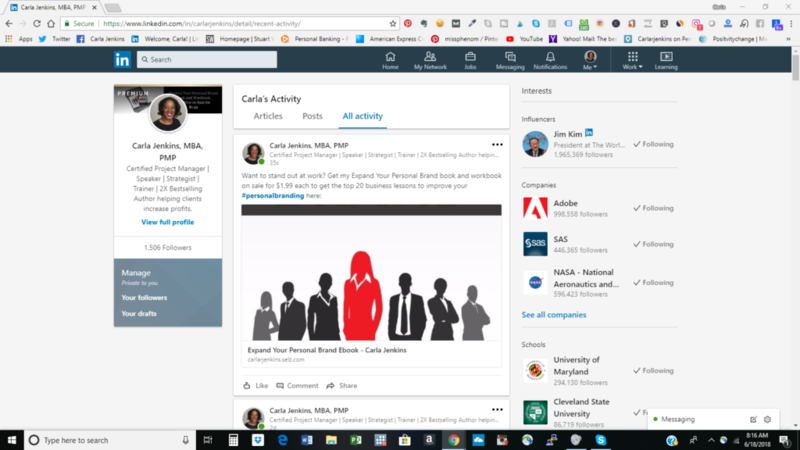 With numerous business videos and over 250 LinkedIn Pulse articles covering social media, personal branding and project management there are 1500 reasons to follow me on LinkedIn. Follow me on www.linkedin.com/in/carlarjenkins for the latest and greatest on LinkedIn. If you are a business, partner with me on LinkedIn Profinder at www.linkedin.com/pro/carlarjenkins. My areas of expertise are branding, social media, strategy and project management.